*1 Theory: Junqueira L.C. & Carneiro J. (2004, 10 th ed. ), Functionele histologie [Functional Histology], Maarssen. Elsevier. Chapter 13, ff. 297, ‘Bloed en bloedcellen’ [Blood and blood cells]. *2 Figure: Clara, M. (1974), Atlas der normalen mikroskopischen Anatomie des Menschen [Atlas of normal microscopic human anatomy], Urban & Schwarzenberg. p. 271, ‘Die korpuskulären Bestandteile des peripheren Blutes’ [The corpuscular components of peripheral blood]. 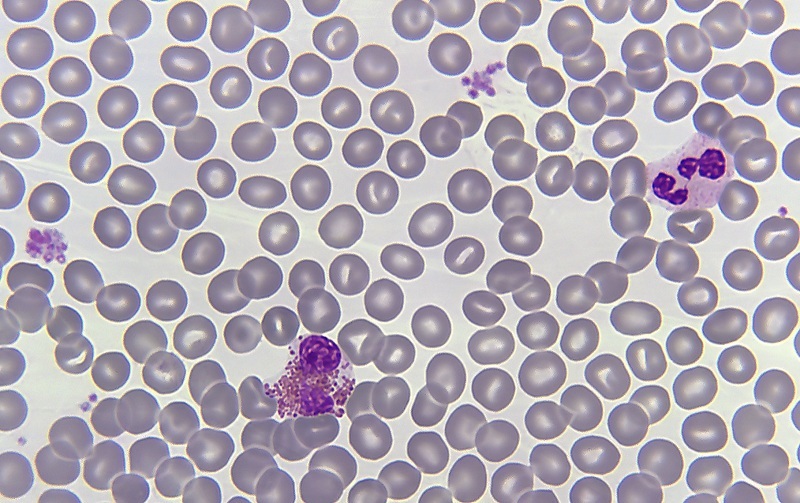 Aim of creating a specimen: Making a human blood smear, staining the sample and naming the various blood cells. When blood leaves the circulatory system it coagulates, with the fibrinogen from the blood plasma forming a network of fibrin fibres which traps the blood cells. The clear fluid released over the course of coagulation is called serum. Serum is different from blood plasma in that the coagulation proteins have been removed. Blood which can no longer coagulate due to anticoagulants (heparin, citrate, etc.) is separated into three layers by centrifugation. 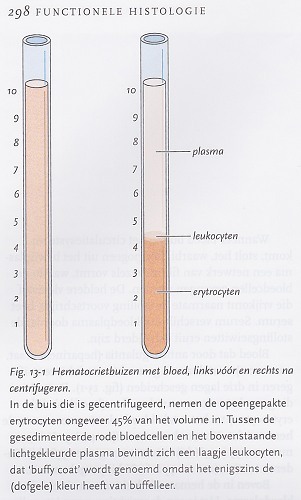 The ratio between the blood cell volume (mainly erythrocytes) and the total blood volume is known as the haematocrit. Normal values are 20-50% for men, 35-45% for women, about 35% for children aged 10 and under, and 45-60% for newborns. 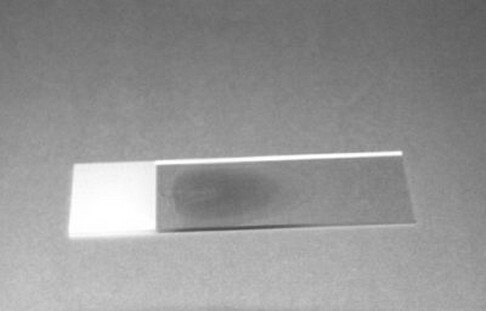 Blood plasma collects at the top of a haematocrit tube. It is a transparent, sometimes somewhat yellowish, slightly viscous fluid. 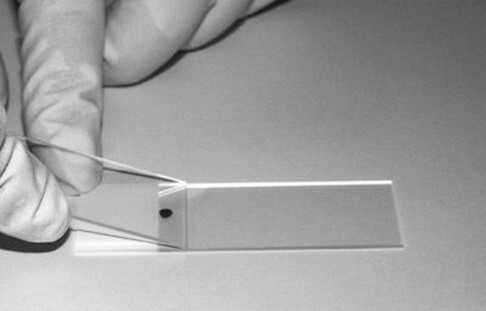 At the bottom of the haematocrit tube are the blood cells, divided into two layers. The lower layer is red and comprises only erythrocytes. The thin layer above this one, which is greyish white and comprises leukocytes, is known as the buffy coat. The division is the result of the leukocytes having a lower density than the erythrocytes. 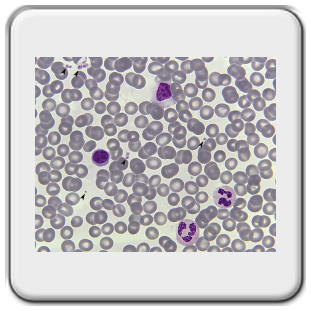 Above the layer of leukocytes is a layer of thrombocytes which under normal circumstances is invisible to the naked eye. Erythrocytes (red blood cells) are mainly involved in the transport of O2 en CO2. This is mostly done by binding these to the erythrocytes’ haemoglobin. In addition, CO2 is able to bind to other proteins in the erythrocytes, while it is also present in dissolved form in the plasma as CO2 or HCO3-. Mammal erythrocytes do not have a nucleus; human erythrocytes are biconcave discs which on average are 7.5μm in diameter. Observations in vivo (in the living organism) have shown that erythrocytes in narrow capillaries (the smallest blood vessels in the body) or ones passing branches in the capillary system become strongly deformed, often taking on a bowl shape. 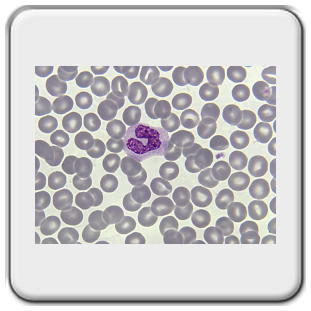 Since erythrocytes are malleable, the blood viscosity on the whole remains fairly low, despite the fact that nearly half of the blood consists of cells. 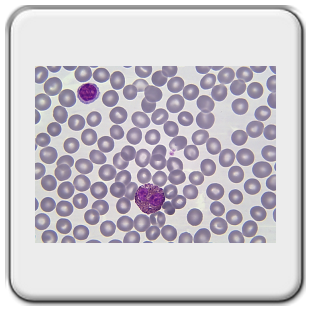 White blood cells (leukocytes) can be categorized as follows. 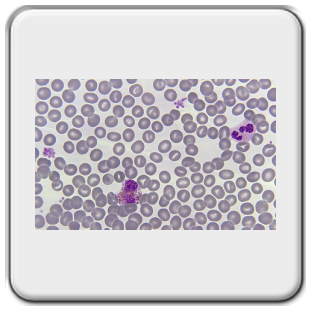 Granulocytes and agranulocytes (a.k.a. 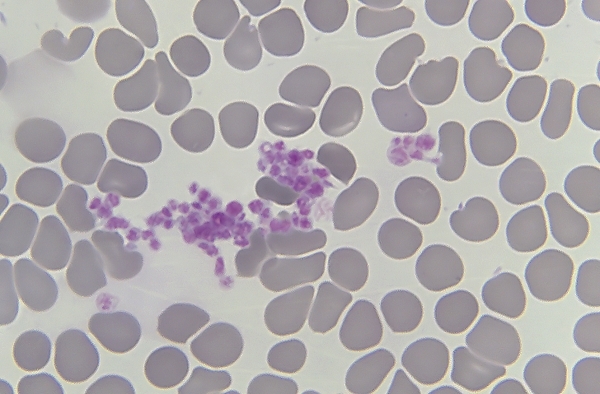 mononuclear granulocytes, characterized by the absence of granules in their cytoplasm). TEM image of an erythrocyte. On the left the original image, on the right a version coloured with Photoshop. Image by Carsten Dittmayer, University of Berlin. 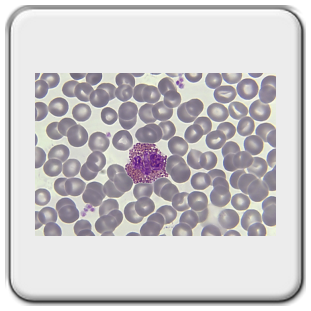 Neutrophil granulocytes develop in the bone marrow and are released into the bloodstream once they reach a certain stage of maturity. Chromatin lines the nuclear wall in all granulocyte nuclei. 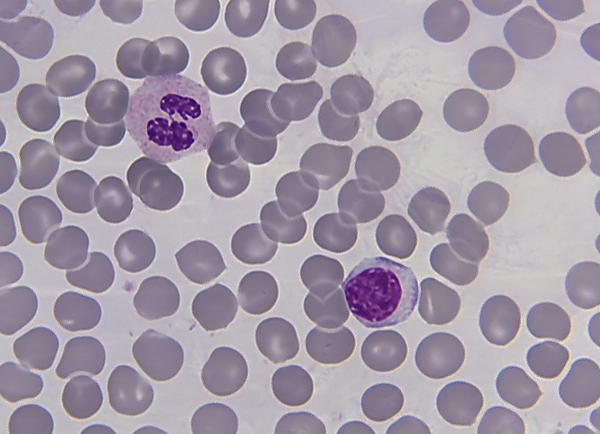 Neutrophil granulocytes have nuclei which comprise 2 to 5 segments connected by chromatin bridges. The number of segments runs parallel to the cell’s age. 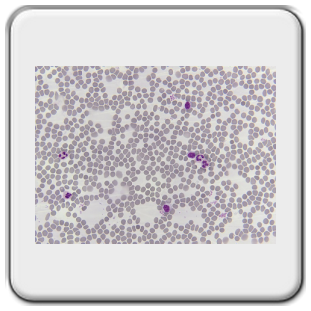 In the event of hypersegmentation, the majority of the neutrophil granulocytes will have more than 5 segments. In certain anomalies, this can also occur in young cells. In women, the inactive X chromosome may be visible as a protrusion of one of the nuclear lobes (‘drumstick’ phenomenon, Barr body). 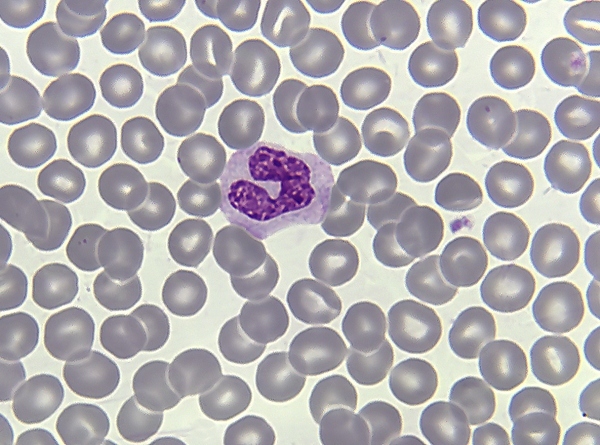 An immature neutrophil (band cell/band neutrophil/stab cell) has a nucleus which is curved, not lobar (horseshoe-shaped). 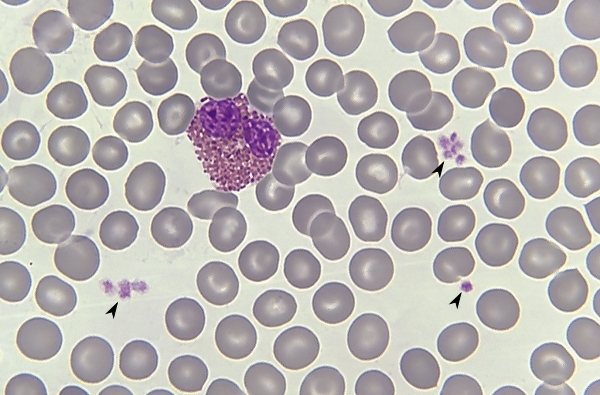 An eosinophil granulocyte has a characteristic lobed nucleus with two lobes. The endoplasmic reticulum (ER) and Golgi apparatus in the immature cell are not very highly developed. 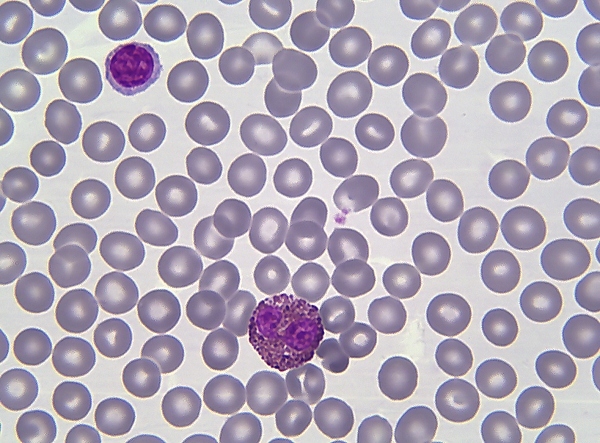 The cytoplasm contains large, oval, specific granules (200 per cell) which stain strongly with eosin. These in turn contain the major basic protein (MBP) which forms 50% of the granules’ total protein. It plays an important role in killing worms and parasites. 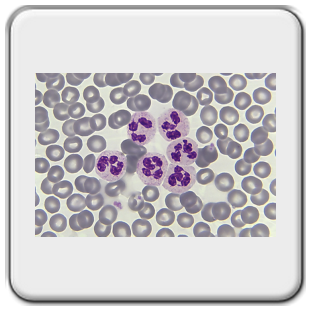 Eosinophils are important for the phagocytosis and elimination of antigen-antibody complexes which have been formed as a result of an allergic reaction. 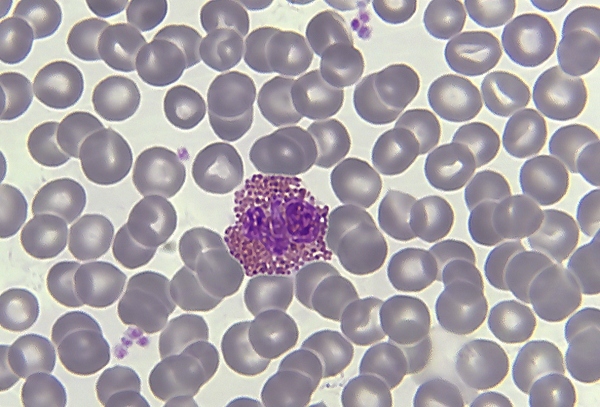 A basophil granulocyte nucleus is divided into irregular lobes and is usually overshadowed by the many and relatively large specific granules in the cytoplasm. The granules are irregular in shape and size, and give a metachromatic staining reaction. The granules are surrounded by a membrane and contain heparin (an acid) and histamine. 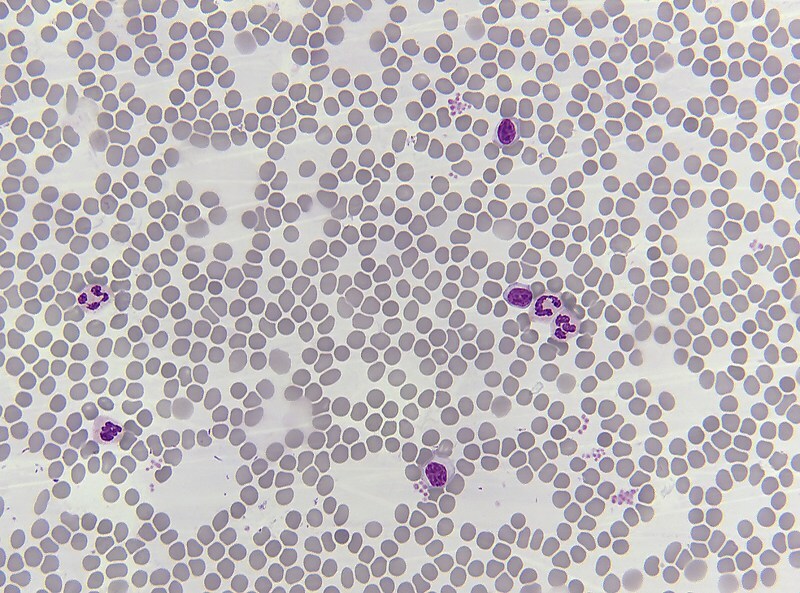 Basophils can generate leukotrienes which can cause a slow contraction of smooth muscle tissue. The large nucleus of a monocyte is kidney-shaped to horseshoe-shaped and usually located eccentrically. The chromatin is distributed much more finely than in a lymphocyte and contains 2 to 3 nucleoli. 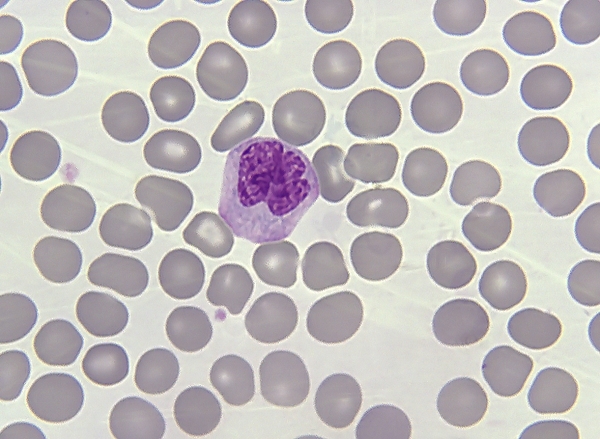 The cytoplasm is slightly basophil and contains small non-specific azurophil granules (lysosomes). It has a poorly developed rough ER, free polyribosomes, well-developed Golgi apparatus (production of lysosomal granules), small, elongated mitochondria, and has microvilli and pinocytosis vesicles spread across the cell surface. 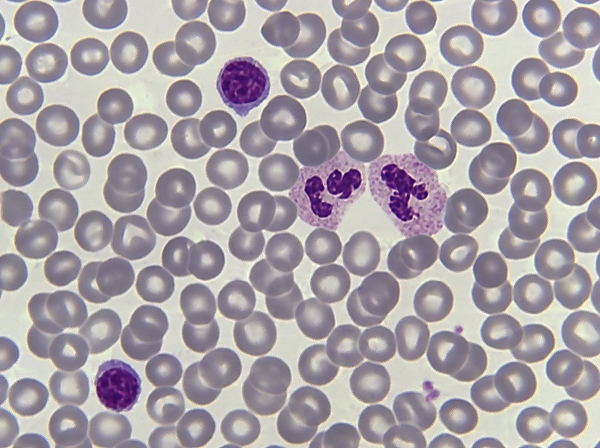 They are present in peripheral blood, connective tissue and body cavities, and form part of the mononuclear phagocyte system. In a process known as diapedesis, they penetrate the walls of venules and capillaries, and then differentiate into active macrophages once they have crossed into connective tissue. During this process, the volume and number of lysosomes increases. Their half-life in peripheral blood is a few days, while outside the bloodstream this is much longer. Macrophages play a role in non-specific and specific immunity. They clean up dead cells and can provide B and T lymphocytes with phagocytized antigens, which can then create immunity. 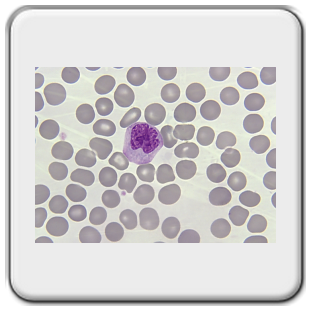 Lymphocytes are at the basis of the specific immune response against such things as microorganisms and foreign macromolecules, and possibly also against cancer cells. 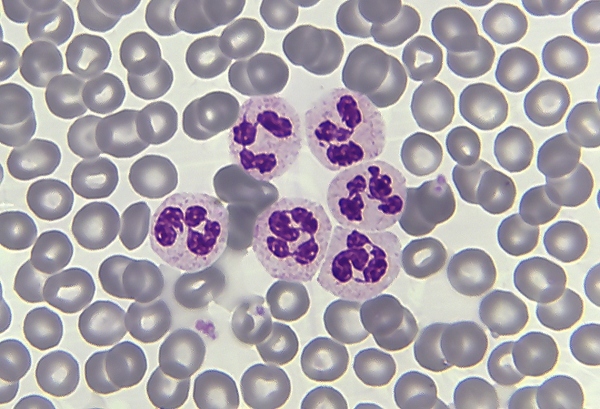 Peripheral blood mainly contains small lymphocytes (6-9 µm). 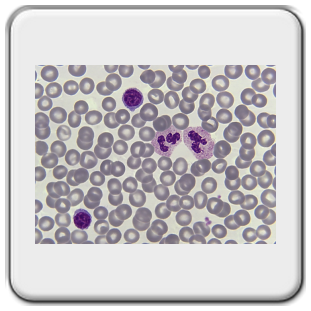 Medium to large-sized lymphocytes are cells which are specifically activated by antigens, and then differentiate further into effector T or B lymphocytes. 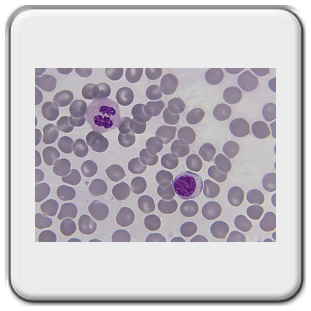 Small lymphocytes have a round nucleus, which sometimes is slightly dented. The chromatin is condensed in large lumps of heterochromatin and there is a nucleolus. The cytoplasm lies in a small, slightly basophil layer around the nucleus and only contains some ribosomes and small mitochondria. 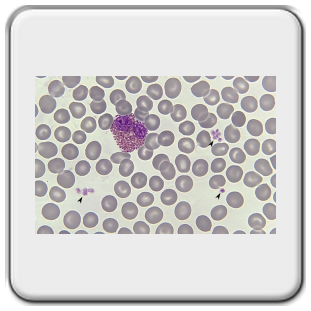 B and T lymphocytes only remain in the blood briefly. They leave the blood via special blood vessels (HEVs: high-endothelial venules) in the lymphoid organs to join the B and T lymphocyte cell populations of that organ. They then return to the blood either via efferent lymph vessels or directly (spleen). This recirculation increases the chance of running into a fitting antigen (surveillance function) and leads to an adequate distribution of ‘memory cells’. 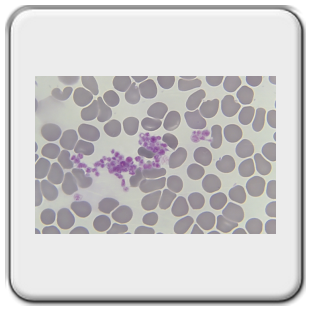 An intriguing video of a granulocyte phagocytizing a bacterium can be downloaded here. Unfortunately it is not one I made myself, but one found on YouTube. Click on the illustration to start the video. 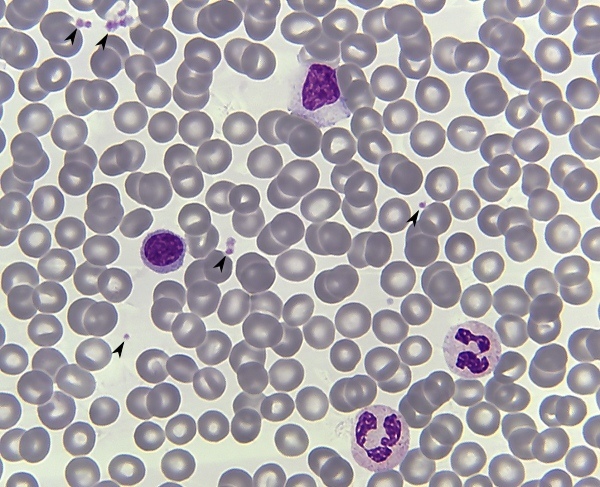 The cytoplasm and nuclei are clearly visible in the centre of a blood smear, while larger leukocytes are mainly found along the edges. At the end of the 19 th century, Dmitri Leonidovich Romanowsky developed a staining technique using methylene blue, azures (oxidation products of methylene blue) and eosin. Related methods are those of Giemsma (used throughout Western Europe), Wright and Leishman. Giemsma stain will be used on this sample. 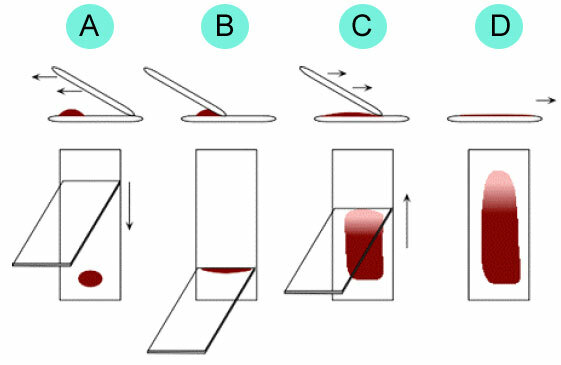 The drawing below shows how a drop of blood is smeared on a microscope slide. It is important that the blood is dragged along behind the second slide and not pushed along in front of it, which would destroy the blood cells by crushing them. The second slide needs to be moved across the first one fairly quickly, but most importantly at a fixed speed. 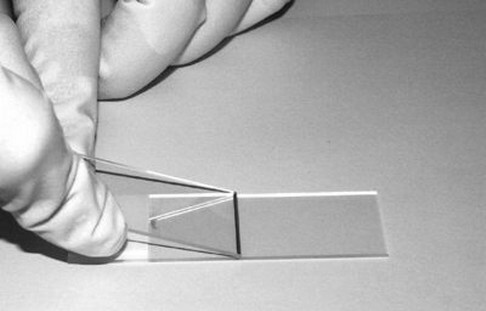 This way a thin layer can be created. 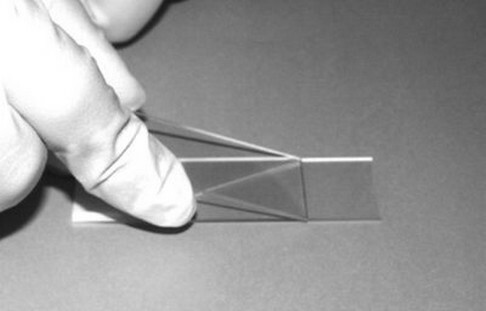 The best places to inspect the smear are along the edges and in the flag (the final part of the smear). Here is the procedure shown again. Apply a drop of blood. 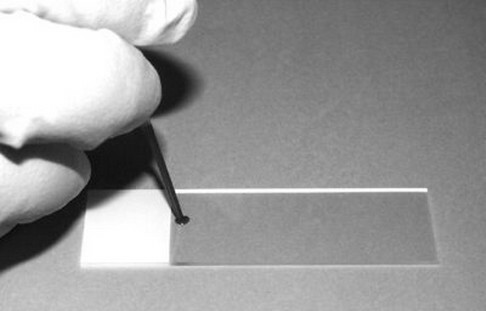 Take the second slide and slowly position it against the drop. Allow the drop to flow along the edge. 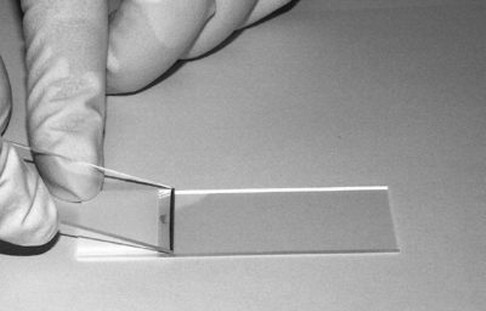 Smear the drop at a fixed speed in a single movement. Continue to smear to the edge of the slide. Dry the slide in open air for one hour.